There are so many wonderful antique cookbooks available that it can be hard to choose my favorites. I’ve explored hundreds of cookbooks printed from the 1600s through 1950s over the years and, unsurprisingly, they are as varied in topics and recipes as modern cookbooks are today (except during the period when authors unabashedly and liberally borrowed recipes from other books and stuck them into new compilations). The books selected below are the few that hooked me into collecting cookbooks. In the interest of full disclosure, links to the books are affiliate links to Amazon. The savvy reader will note that A History of Cookbooks is not a cookbook, and you’d be correct! This particular book is about 700 years of cookbook history written in a fairly accessible style for the non-academic. You’ll discover everything you need to know about understanding your cookbook collection – and even some connections to how cookbooks are published today. For example, did you know that there’s a period in cookbook history where plagiarism was rampant? Recipe collections and even picture (or woodcuts) would be re-printed under new authors by the printer to help boost sales. There was also not-so-friendly competition between cookbook authors, who were seen as second class citizens to their literary counterparts. This is a great book for those interested in this history of cookery books. Should I buy reprints or antique versions of cookbooks? That’s a personal question. If I find an antique cookbook for sale at a book shop or thrift store that isn’t too expensive, then I might pick it up. Cookbooks that cost hundreds of dollars are for the experienced collector, however. 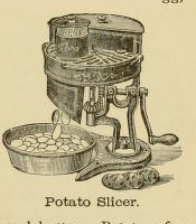 The beauty of the internet is that many antique cookbooks have been scanned for reprint in a soft cover version at a very reasonable price or even for free through the Library of Congress. A Thousand Ways to Please a Husband is one of the most enjoyable additions to any cookbook collection. The book has mini chapters that begin with a narrative of a young woman, named Bettina, set in 1917. She is a newlywed and describes her daily events, from decorating a new house, to meeting new friends in the neighborhood, to hosting luncheons and dinner parties. Interwoven with this narrative are the menus and recipes that Bettina prepares throughout the day. The authors wanted to help newly married women learn how to cook. You will love the narrative stories that give a peek at domestic life back during WWI. The simple recipes are accessible to any cook of any skill level. And if you’re looking for a gift for a bride-to-be who enjoys cooking, A Thousand Ways to Please a Husband is truly a unique find. Alexis Soyer’s Shilling Cookery for the People, 1855, is a classic in the antique cookbook arena. Alexis Soyer was a nobleman-turned-cookbook author who published several volumes during his life. He wrote niche cookbooks, including one for military encampments. This particular book was written for those recovering from the Potato Famine in Ireland. Soyer was something of a philanthropist. Some recipes are bare-bones with several admonishments on ways to cutback waste and economize if only one had the proper skills and knowledge. What is so enjoyable about this particular cookbook, is that Alexis includes colorful cultural references to life in 1855. Here’s a delightful excerpt on Frying Pans, Bachelors, and Lumbago. Alexis was a formidable writer expressing self-confidence, wit, and irreverence. Another classic, Mrs. Beeton’s Book of Household Management, 1861, will be the fattest cookbook you ever own. The book has an interesting history. The woman who first wrote it, Mrs. Beeton, actually died at a relatively young age before the book picked up a publisher. Her husband went on to finish the book and publish it under her name. It’s gone through many, many additions, each adding to the volume. The recipes were gleaned from other cookbooks and stuffed into this expansive publication. What makes it particularly enjoyable, is that it not only includes recipes, but instructions on household management, finances, marketing, and cleaning. Check out the Index. How about 7 pages for pigeon recipes? To the delight of many readers, each chapter will begin with an encyclopedic description and classification of the animal or plant or food category that is the focus of a given chapter. You will learn all about classes of fish, birds, and wild game. No detail is left out. This book will keep you busy for hours. Fannie Farmer’s famous 1896 cookbook changed cooking forever. She ran a cooking school for young ladies in the Boston area. Her claim to fame is standardizing cooking measurements and referencing them throughout her cookbook. No longer do you see references to ‘a teacup full of sugar’. How big of a teacup? Is it flush with the lip? Or does it mound on top? Without exact measurements, recipes from cookbooks were more art than science. Fannie Farmer also actually made all of the recipes that were included in her cookbook. This was not a compilation from previous publications. These recipes were written for young women with little knowledge of cooking. They could pick up the book, apply the basics, and successfully prepare full meals. The wide range of recipes (e.g., tomato soup, or peas and carrots) means that Fannie Farmer’s work can continue to be a go-to cookbook for the modern home. There’s actually an entertaining documentary about this cookbook made by the Cook’s Illustrated team.